Millersville University employees can access the PASSHE Employee Self Service (ESS) portal by logging in with their Millersville Outlook email address and password. 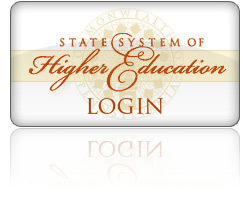 The PASSHE Employee Self Service (ESS) portal allows Millersville University employees to submit leave requests and to review various benefits and payroll information specific to them through a secure online portal. Employees also use ESS to update some of their personal employment-related data such as their primary contact number, Emergency Contact Information, W-4 tax information, educational degree and dependent social security numbers. The information is stored in the SAP Human Resources/Payroll System. To use this new service, follow the steps in the full user guide. If you already know your PASSHE AD username and password, proceed to login above. Make sure your Millersville account is enrolled in the myAccount@MU password portal. Many users have already completed this step as part of our password policy change in 2009. Use the myAccount@MU password portal to change your password. Millersville Outlook passwords must be changed on or after 12/8/2010 to be synchronized to PASSHE ESS. If you have forgotten your Millersville Outlook password or your account is locked out, you may reset your account using these instructions.